The Volkswagen Scirocco range has been subtly refreshed. A price drop makes the entry-level Scirocco better value, while a new R Line specification brings more dramatic looks inside and out. Every model in the range now comes with RNS 315 touchscreen satellite navigation, including the entry-level Scirocco, the price of which drops by between £420 and £600, depending on engine. Also now standard are a multifunction steering wheel and 17-inch ‘Long Beach' alloys, while ACC Adaptive Chassis Control is now optional. Move up to GT trim and luxurious Nappa leather upholstery is now standard, along with heated front seats. Also standard are ACC, 2Zone electronic climate control, front fog lights, heat-insulating tinted glass from the B-pillars back and 18-inch ‘Interlagos' alloy wheels. The new R Line builds on GT specification, but adds a dramatic bodykit, with bespoke bumpers and side skirts, and 19-inch ‘Lugano' alloy wheels. Up front are Nappa leather R Line sports seats, an R Line wheel and chrome pedal covers. At the top of the range, the Scirocco R offers the same compelling performance as before, thanks to its 265 PS 2.0-litre TSI engine, while RNS 315 satellite navigation and Nappa leather upholstery are now also standard. 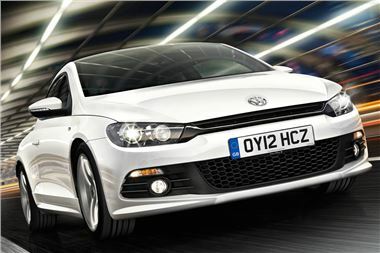 The refreshed Scirocco range is on sale now. For more information visit your local VW dealer or www.volkswagen.co.uk.